The Alnwick Garden is offering a whole host of spooky thrills this Halloween. Immerse yourself in the garden experience by lurking around the ‘Scare Garden Spooky Walk’ or if you’re brave enough take on ‘The Scare Zone’. Alnwick Garden is a great option for families of all ages and they are even offering prizes for the Halloween fancy dress competition this year. Check out their Halloween garden map to find your way around the shadows – it’s not one to miss! This October half term, Woodhorn Museum is hosting some very special Halloween events. Are you up for a pumpkin treasure hunt? If so, Woodhorn Museum Pumpkin Trail opens from Saturday 27 October – Sunday 4 November. Just find all the pumpkins hidden through the museum and colliery buildings and receive a Halloween treat! Completing the Halloween-themed lineup, Woodhorn will also be hosting a day of spine-tingling, ghost stories with the special guest and professional storyteller Stephen Skelton. His chilling tales will uncover what happens after dark at Woodhorn, with true stories from the Northumberland archives about the mysterious ‘man in a leather apron’ lurking in the Coal Town exhibition, troublesome ‘Jack’ causing mischief in Winding House 1, and all manner of strange sights & sounds experienced after darkness falls. The grounds of the former colliery are also dog-friendly so bring along the pups! This Halloween Whitehouse Farm are putting on the ultimate Hay Day Halloween Party bash complete with music, dancing, a 2-course lunch and farm trail. The whole of the Whitehouse Farm team dress up to complete the aesthetic of the event in true all hallows eve style. This is a top choice for those with younger children and it’s definitely going to popular, so be sure to pre-book by calling Whitehouse Farm on 01670 789998. Brocksbushes are upping their game this year with a trio of Halloween events. Brocksbushes is well known for its Halloween events and is a popular attraction for families year round, however, get ready to have shivers sent down your spine with the scariest line up yet. For kids, the farm is running ‘The Greatest Pumpkin Show on Earth’ from Saturday 20th October to Sunday 28th October, complete with tractor rides, a pumpkin trail and live circus-themed show! If you’re looking for something slightly more sinister this October, the farm shop is also taking on its darker side for the older crowd with its haunted ‘Creatures of the Corn’ attraction. Much like last years popular Mine Shaft Thirteen, negotiate the menacing maze with some creepy companions. Both are available to book online so be sure to pick up your tickets before they sell out! If you fancy treading slightly further afield to the bright lights of Newcastle, The Fat Hippo restaurant in Jesmond is offering up a foodie favorite this Halloween. This year the burger joint has put together some delectable Halloween treats for those who fancy something a little less spooky as a Halloween treat. Check out the ‘Hellboy’ and ‘Go Meatless’ on their Halloween menu and plunge yourself into the darkness of a food coma. We hope you’ve enjoyed this selection of our top picks of Halloween events in Northumberland. If you’re looking for something a bit more lowkey this Halloween?  Why not take a break and come and stay with us at William De Percy for some frightening fun. With our cosy rooms and great grub, you can snuggle up for the night of Halloween in the safety of our boutique bed and breakfast. Contact us today on 01830 520261 to enquire, we would love to hear from you! Happy Halloween!